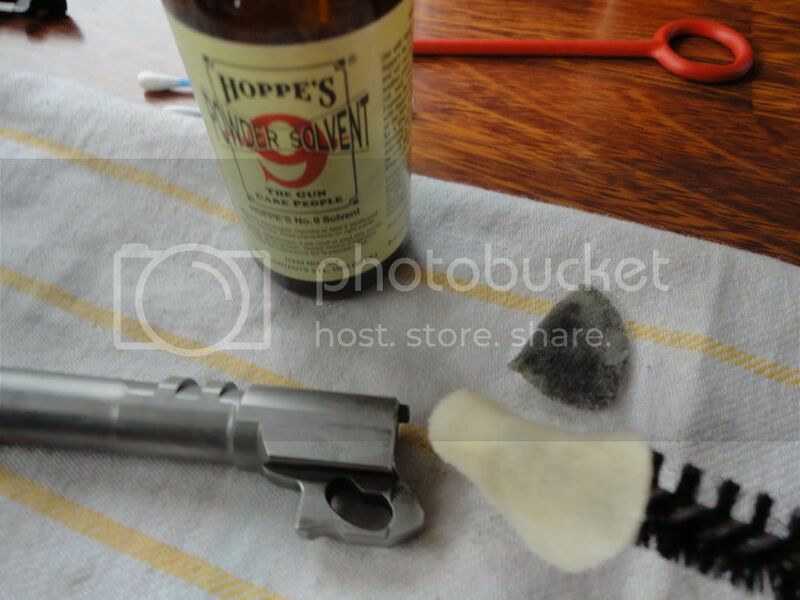 A lot of members and friends have asked me time and again on how to clean their handguns. Most new gun owners seldom find the right guidance which results in a much shorter firearms lifespan. I had a couple of guns to clean today so took some pictures to give a basic "How to". Before anything check and double check your firearm to confirm it's empty. 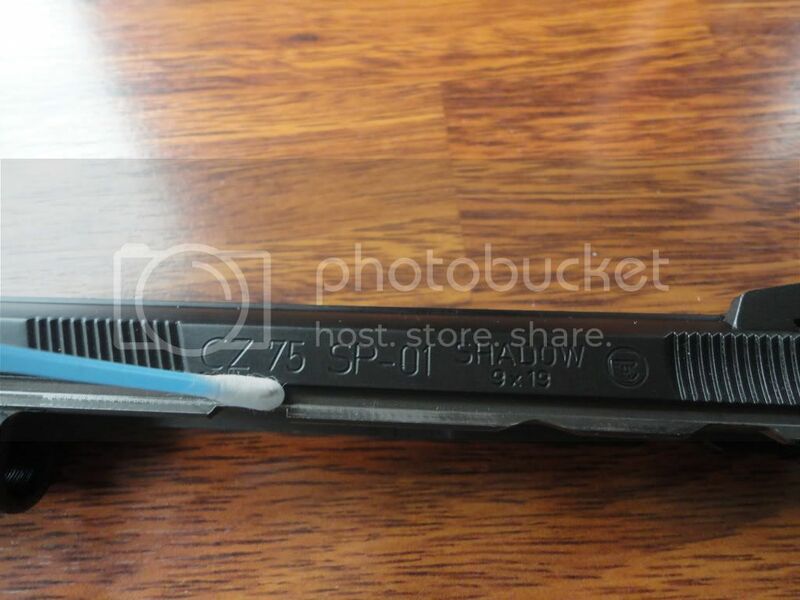 Keep your hand off the trigger, take the magazine out, rack the slide a few times, then engage the slide lock in open position and visually inspect the chamber to confirm. 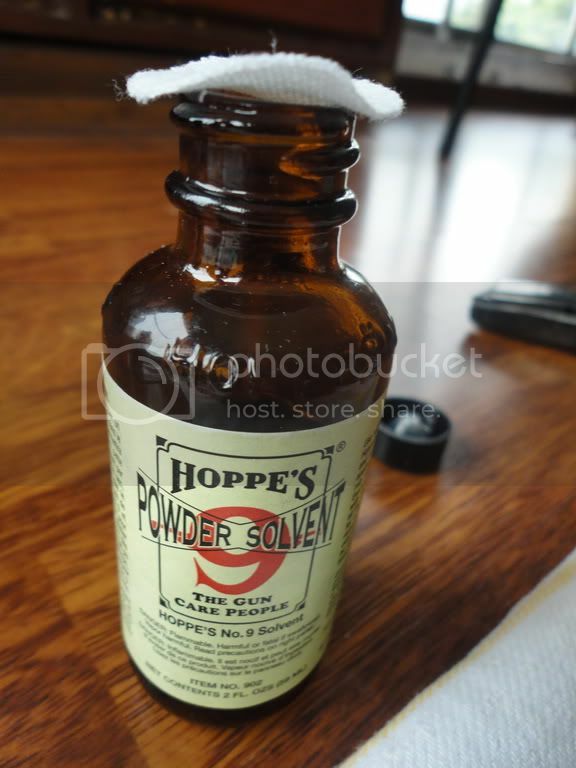 The cleaning tools I use are Hoppes Powder Solvent (Approx Rs. 500), Hoppes Lubricating Oil (Rs. 500), Cleaning patching (buy them or cut up on old lint free cotton cloth), Cleaning brush (Rs. 15). 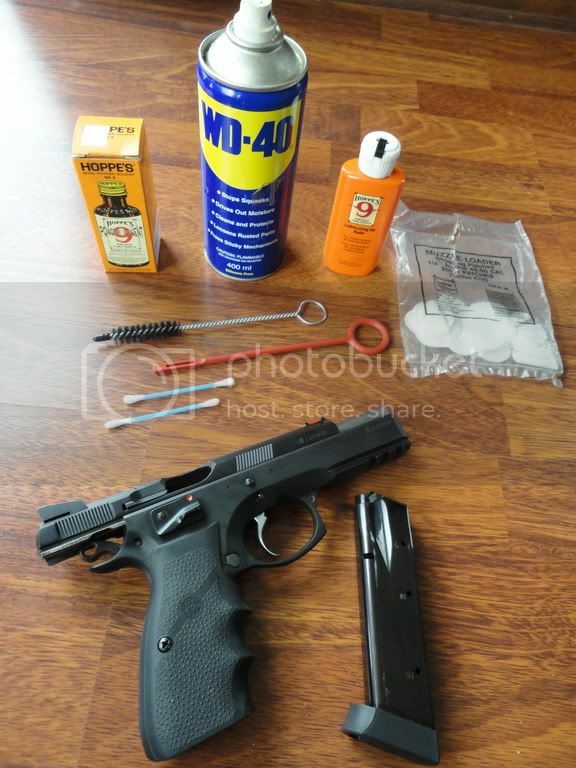 Although I don't use WD40 at all , I have included it in the picture as it can be used in place of both Hoppes products. I don't like it though and would never use it on my handguns. 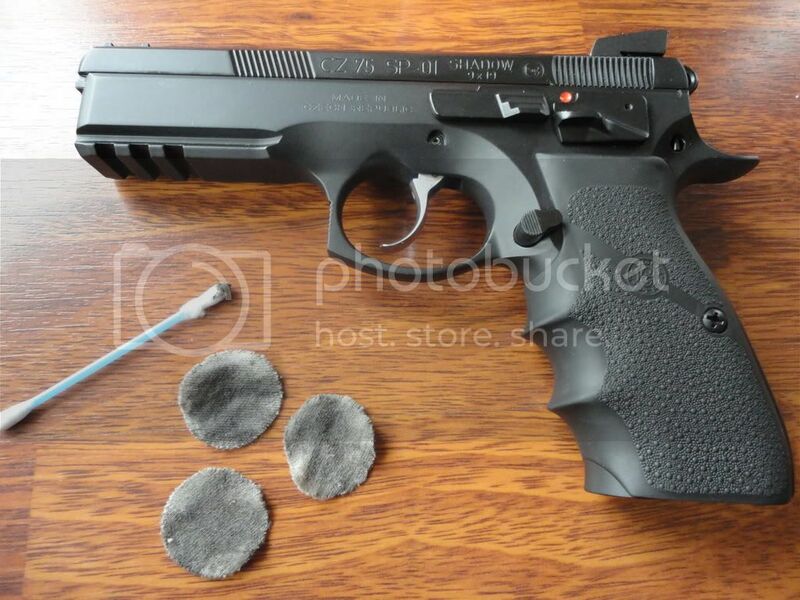 There are 3 main parts of a pistol one must clean, the Barrel, the Slide and the frame. 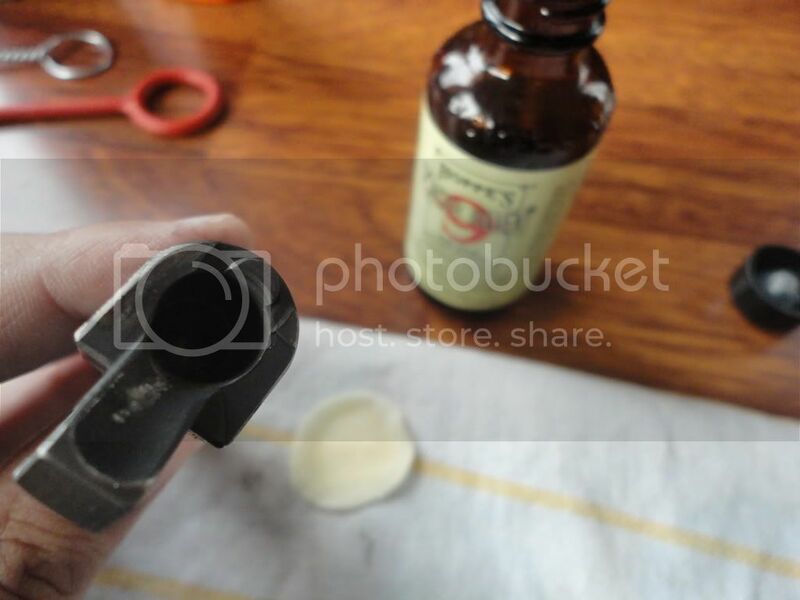 Take a small cotton patch (I use Muzzle Loader Shooting Patches from Southern Bloomer U.K) put it over the bottle and turn it upside down on the patch for half a second. This is after a using the same patch: Clean using it and another patch if you feel necessary. Next run the brush through the barrel a couple of time to loosen any residue stuck in the groves. Then either use the cleaning rod with a patch or put the patch over the cleaning brush and run it though the barrel a couple of times. When the patch gets dirty or misshaped use another one. 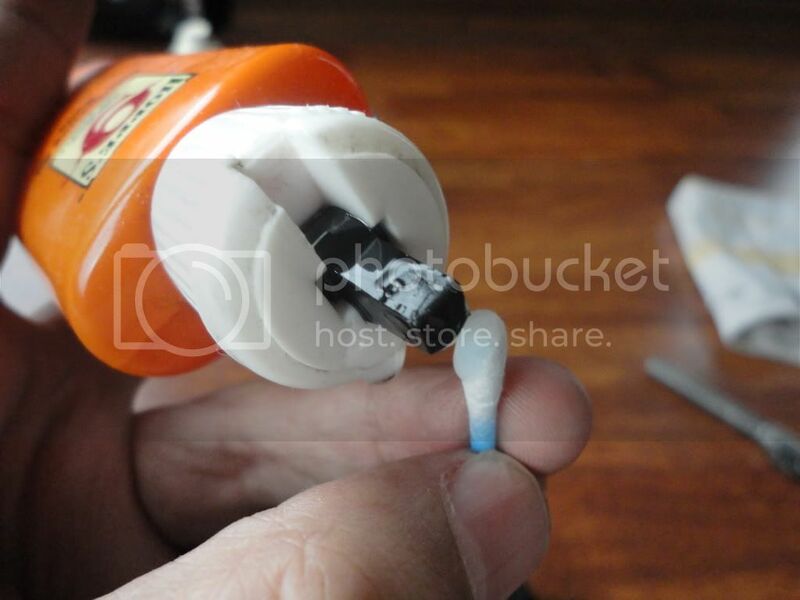 Dip the second patch with powder solvent and the run it though the barrel again a couple of times. 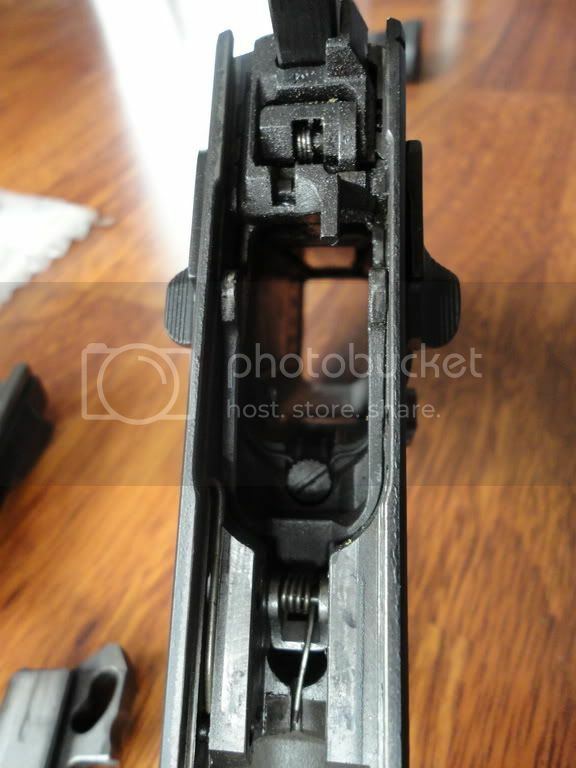 Visually inspect the barrel pointing toward the light to see if it's clean, the slide and frame are to be cleaned the same way. 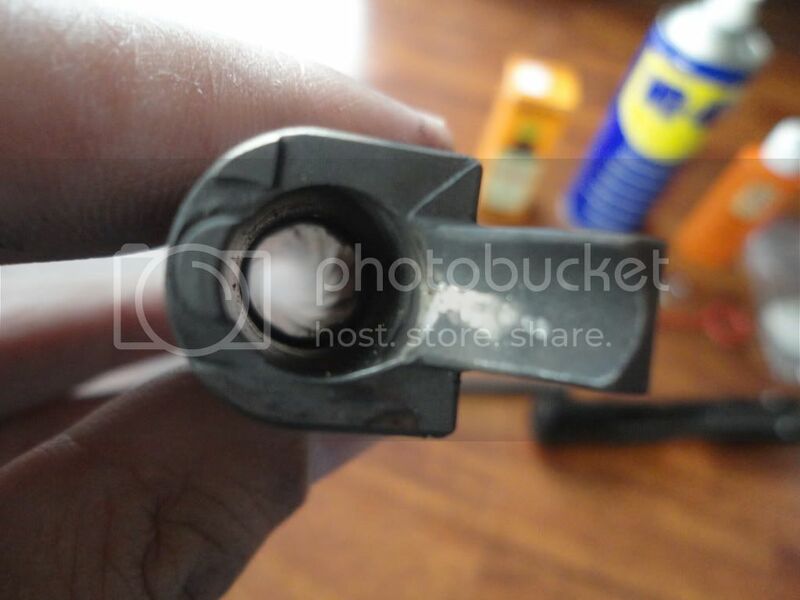 I use the brush on the hammer portion of the frame as well to loosen any grime. 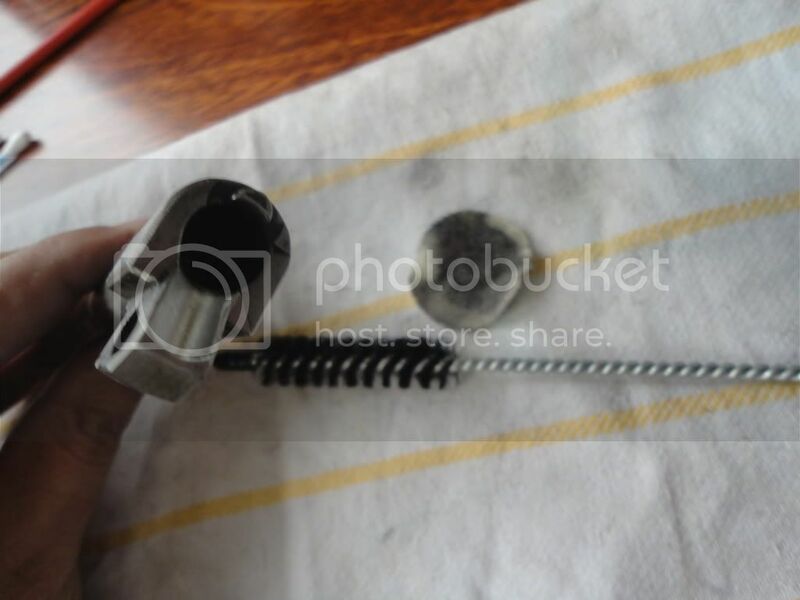 Also I use a small flat screwdriver with the cotton patch to clean the grime stuck between the extractor and firing pin plate. I would also like to mention that some like to use grease instead of oil. That is fine as well as it may or may not help retain accuracy after 5 to 7 thousand rounds. I prefer oil. And that's all there is to it ! 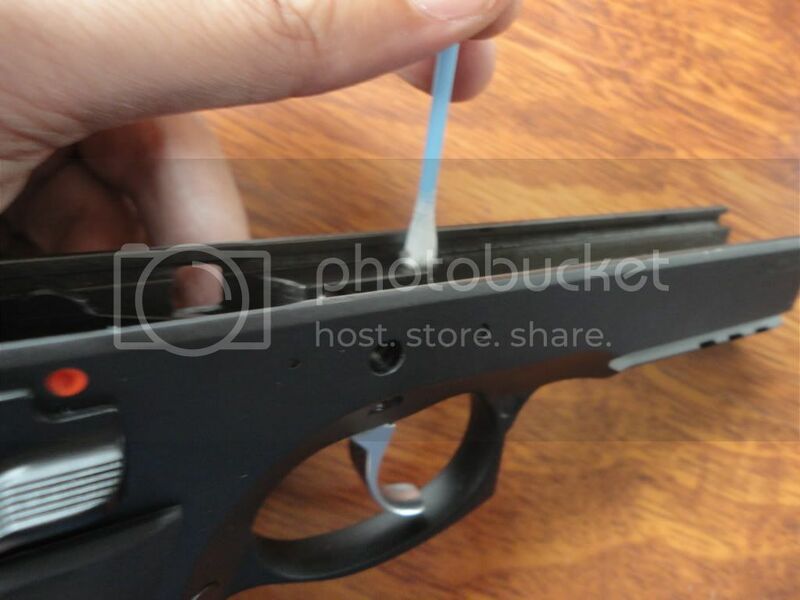 1).There is no perfect way to clean/lube guns. Everyone has a slightly different preference. In the write up above I have shown you mine. 2). Some people like to apply a touch of oil to the barrel. I don't, when fired the oil heats up the barrel much more and over time it will kill your barrel faster. Before storing guns is another matter and again should be cleaned before use. 3). Never dip your handgun slide in Diesel / Mitti ka tail etc. 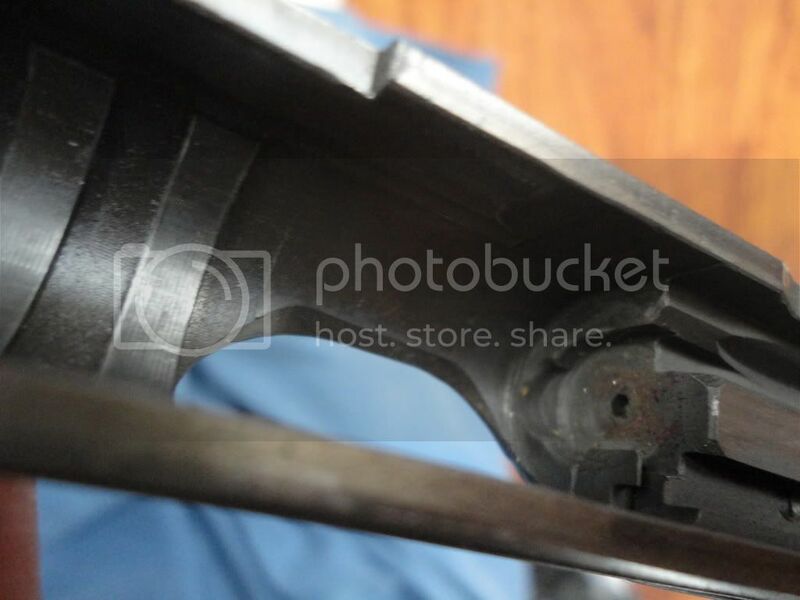 Apart from damaging the finish and smelling nasty, it will get inside the firing pin area, loosen all the grime which in most cases gets stuck on the firing pin causing failures to fire. 4). 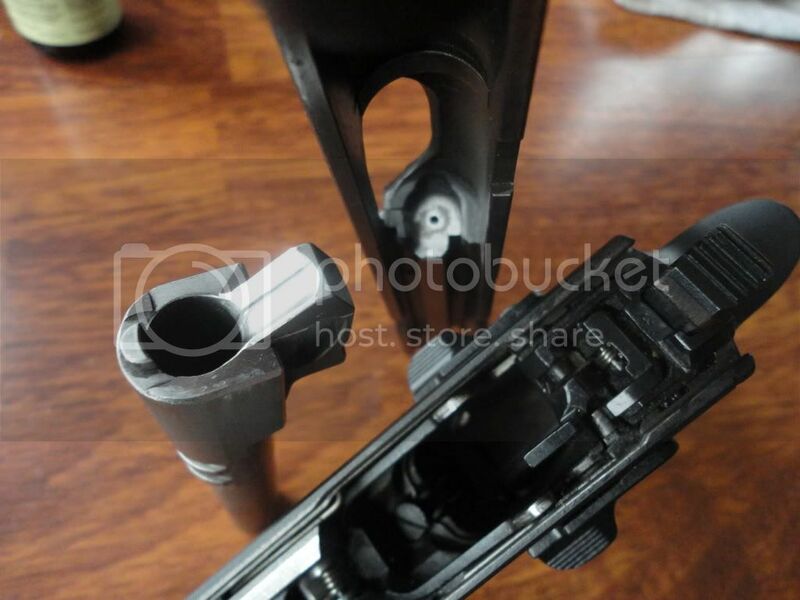 I disassemble and clean my pistol magazines after about 1000 rounds. 5). I also like to take off the grips every 1000 rounds and clean the grip area from inside. 6). Never fire your gun with the slide off. 7). Loaded or not, always practice gun safety.